Whitley Bay players celebrate Ross Wilkinson giving them the lead against Morpeth Town. Morpeth Town took all three points at Whitley Bay on Saturday as they came from behind to score the winner 12 minutes from time. Ross Wilkinson’s first half header gave the home side the lead, but the visitors quickly levelled, and while both sides created further chances, top class goalkeeping especially by Bay’s man of the match Tom Flynn, kept the game in the balance until the closing stages. The first chance came with seven minutes played when Liam Henderson broke through for Morpeth but Flynn raced off his line to block the ball which was then cleared by Chris McDonald. Three minutes later good work down the right by Tom Gilbey set up a chance for Peter Glen-Ravenhill, who replaced the injured Kyle Patton in the starting 11, but the recent signing from North Shields could not get a clean strike on the ball and his shot was blocked. Midway through the half, Tom Potter’s dangerous cross from the left was gathered by keeper Karl Dryden just inches ahead of the on-rushing Thibault Charmey. There was little to choose between the sides at this stage, but it was Whitley who made the breakthrough just past the half hour. Potter played a right wing corner short to Charmey, who returned it back down the line to Potter and his low ball across the edge of the six-yard box reached Wilkinson who stooped to head firmly past Dryden. Two minutes later Glen-Ravenhill fired narrowly wide for Whitley but Morpeth retaliated and drew level in the 36th minute when Fry capitalised on a slip by McDonald and crossed for Mark Davison to head home. Morpeth then had a good spell leading up to half-time, with Keith Graydon’s long range effort taking a slight deflection as it flew past the upright. Morpeth midfielder Ben Sayer brought a fine save from Flynn nine minutes into the second half and shortly after, Sean Taylor also tested the Bay keeper. The offside flag denied both sides on several occasions, but a ball over the Morpeth defence in the 66th minute almost set Charmey clear but Sayer did well to put the ball behind for a corner. Shortly afterwards, Callum Patton was tripped 25 yards from goal but Whitley were unable to capitalise from the free kick. Morpeth continued to have the better chances, but throughout the team Whitley worked hard to contain them. Flynn made a great save to deny Henderson when the visiting striker was played clear on goal and looked odds-on to score. Graydon then went close before Flynn kept out an effort from Taylor. The visitors were getting on top and shortly after Henderson was thwarted by Flynn, Morpeth grabbed the decisive goal, although it resulted from errors by both sides. A misplaced header by Henderson from a cross into the box saw the ball run loose. It was not properly cleared and fell for Taylor who smashed the ball into the net from 12 yards. Whitley battled to get back into the game and substitute Liam Brooks fired not far wide before Morpeth sub Michael Chilton almost sealed victory with a powerful volley that Flynn pushed clear. There was still time for Whitley to go close and with the game in stoppage time as Chris McDonald almost rescued a point with a curling shot that Dryden did well to fingertip round the post. 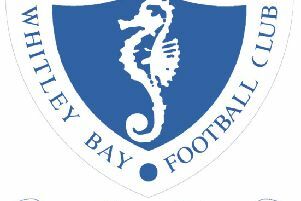 Whitley Bay: Flynn, Gilbey, McDonald, Haley, Anderson, Wilkinson, Potter (Robertson 75), Patton (Brooks 81), Glen-Ravenhill, Kempster, Charmey. Subs not used: Allen, McCarthy, Keltie. h2o Bathrooms man of the match: Tom Flynn.